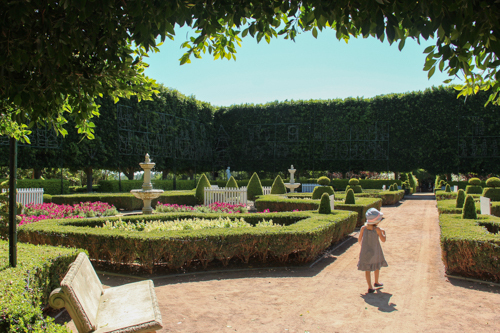 We’ve enjoyed various botanic gardens during our travels, but it was a gimmick that brought us to the spectacular 25-acre planned garden in the wine-region of the Hunter Valley. 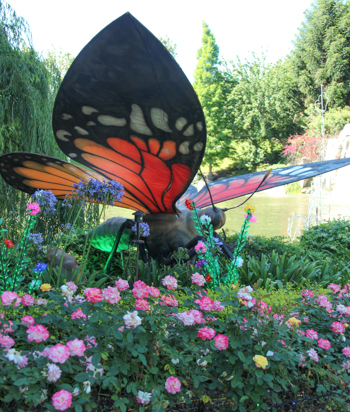 Hunter Valley Gardens is attracting families this January with a combination of a late Christmas-light displays and animatronic creepy-crawlies. 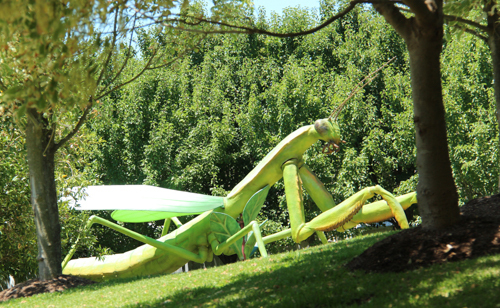 At 8-metres-long, Marty the praying mantis is Hunter Valley Garden's largest drawcard during this school-holiday season. Most of the attractions we visit are the result of a family consensus. 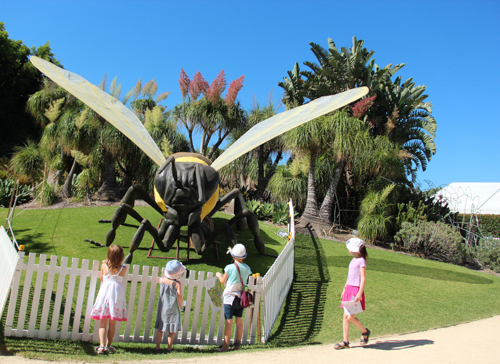 When we noticed the sign on the highway promoting Mega Bugs, we stopped to look it up online and talk about whether we thought a visit to Hunter Valley Gardens was something we wanted to do. Two of the girls really wanted to see the exhibit and two didn’t particularly care, so we headed west from Newcastle to check it out. For a passive attraction, the entry price for our family felt quite steep. We paid $100 to gain day-entry to the gardens. I understand that the gardens must have been costly to establish and maintain, but at a price like this, I won’t recommend it heartily. Calista stops long enough to examine a statue. 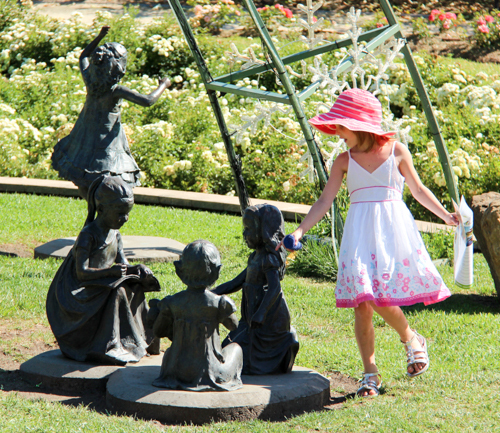 The girls like to try to relate each character within a cluster of statues to our family members. 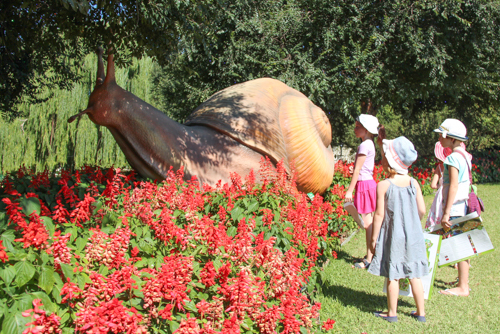 The first "bug" we encounter in the gardens is a large snail. The butterfly flaps its wings and moves its antennae. 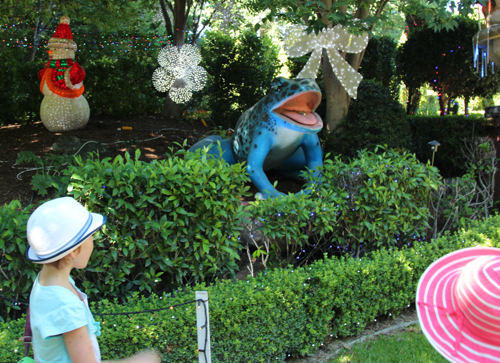 Hunter Valley Gardens are still offering Christmas-light tours at nighttime, and the displays are standing throughout the gardens. 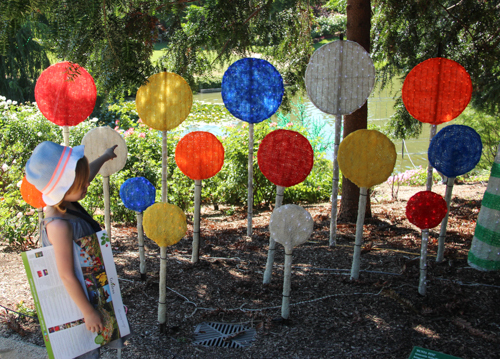 We love this section full of lollies! 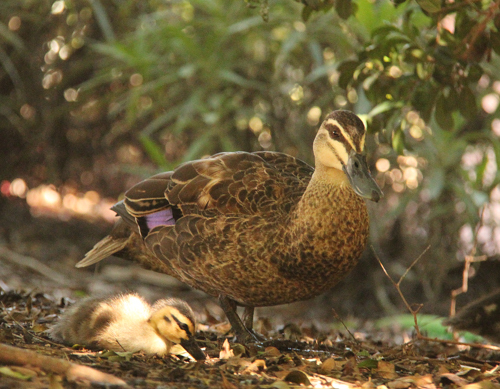 As we wander around, the girls notice this mother duck with two ducklings. 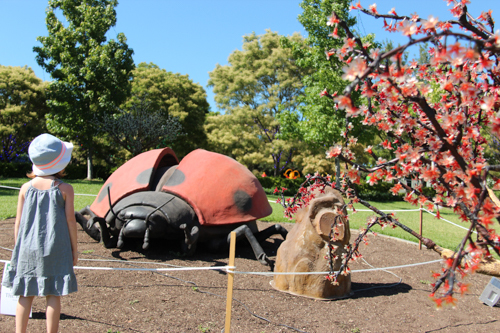 Each display's movement is triggered by a motion-detector at the front of the bug. Brioni informs us that the blue poison dart frog is one of the most poisonous creatures on the planet. This one is harmless as it only squirts water from its open mouth. 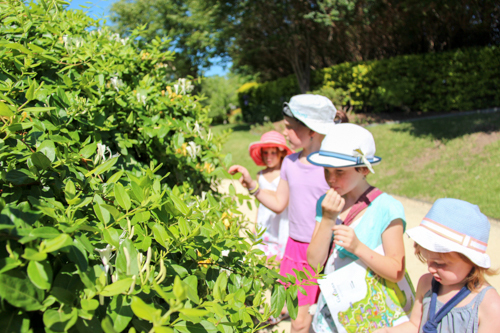 The "bugs" are scattered throughout the gardens so we are inclined to explore the whole place. Although we're here for the bugs, we can't help but notice that the Christmas-light displays are made of plastic, adding an incongruous note to the garden's natural beauty. Not a leaf is out of place in the formal garden. 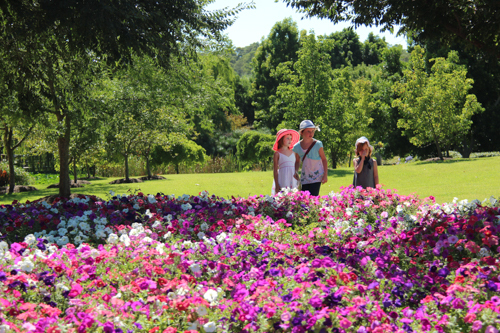 I am amazed by the huge displays of colourful annuals. I've always preferred to plant perennials and so admire those with the patience for annuals. 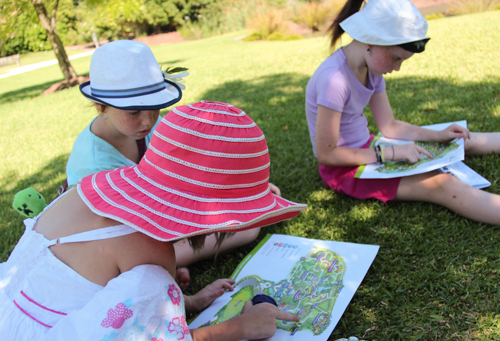 We pause in the shade to look at our maps and work out which paths we next want to explore. Like a row of butterflies, the girls seek out the nectar at a hedge of honeysuckle. 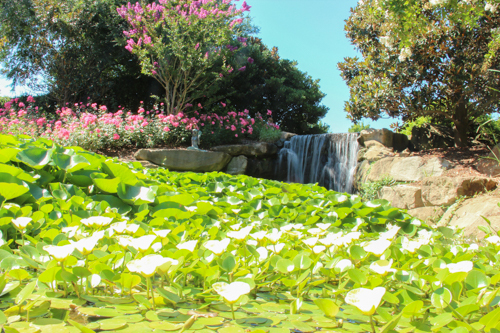 Several waterfalls, creeks and ponds add interest to the gardenscape and attract waterfowl and insects. 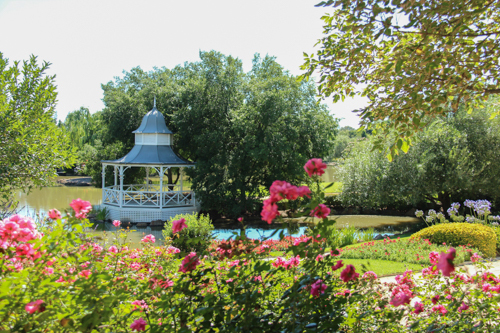 Two small lakes sit at the bottom of the gardens. 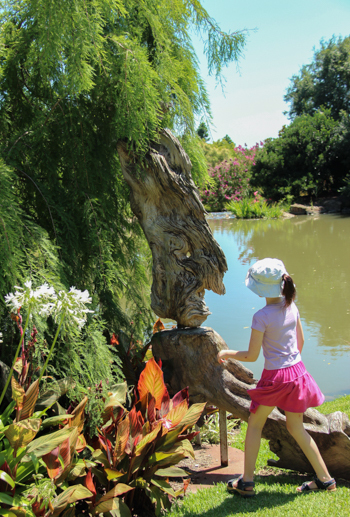 Aisha points out the facial features that she can identify in this naturally-formed sculpture of weathered timber. 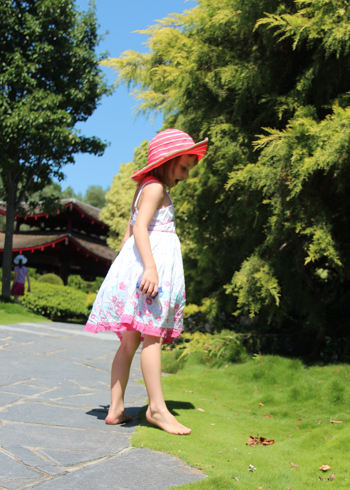 In the Japanese garden, the softness of the grass is impossible for Calista to resist! 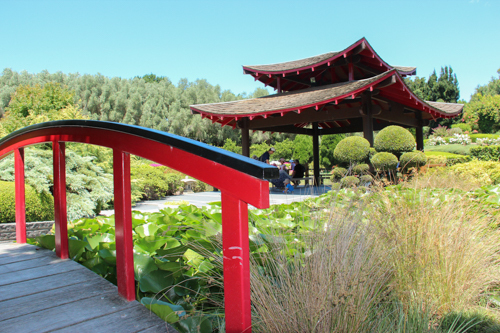 The pagoda and and red bridge complete the iconic Japanese style. 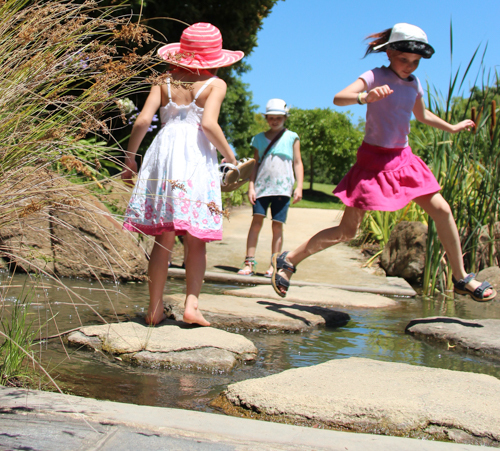 The girls pause to play where the pathway crosses a creek with some stepping stones. 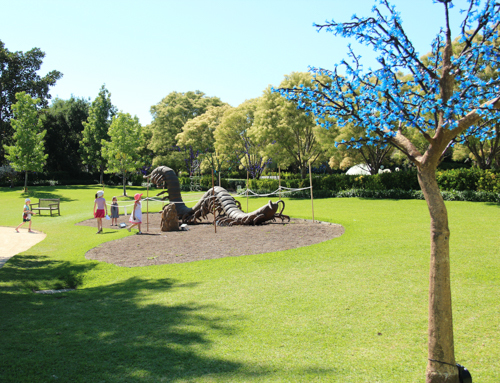 The gardens are complementary combination of formal and informal designs. 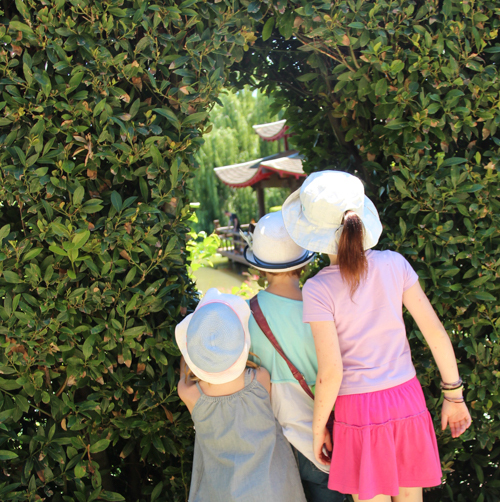 A viewing hole in the hedge displays the Japanese garden on the other side of a pond. 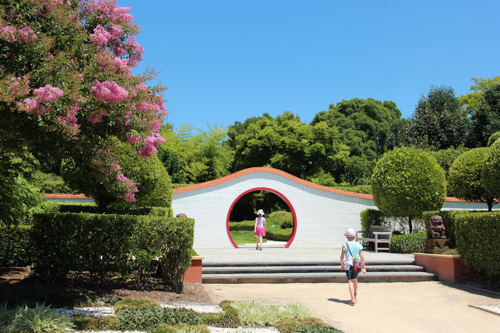 A moon-gate marks the entrance to another Asian-themed garden. 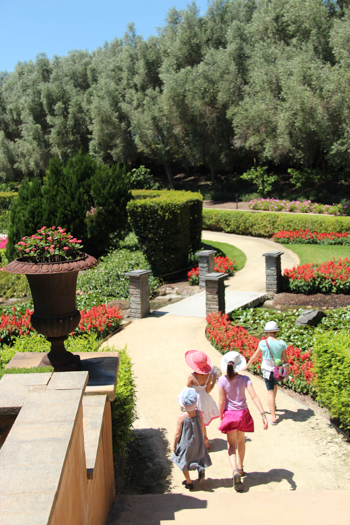 At the end of several hours of wandering through the gardens, we agreed that we enjoyed ourselves. The “bugs” themselves were a disappointment but at night-time the Christmas lights would probably be amazing. As a detour and a day-outing, we enjoyed ourselves, but now that we’ve been here and done that, we’re unlikely to return.